Cream butter and brown sugar. Add eggs and vanilla, mixing well. Add flour, cinnamon, baking powder, and salt. Stir well. Stir in apples and nuts. Spread batter into a greased 9 x 13-inch baking pan. Bake at 350 degrees for 30-35 minutes, until brownies test done with a fork and slightly browned on top. 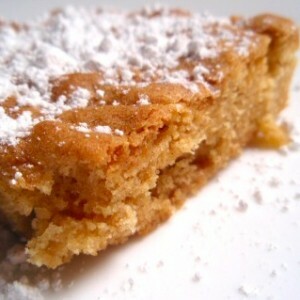 Cool; dust top with powdered sugar and cut into 24 squares.